hard to believe i ran the marathon just 2 short weeks ago. it’s one of those crazy things that wasn’t even on my radar of things i want to do in this lifetime.. not even within reach, so i didn’t think about. but then one day, i did. and i ran it. now that i’ve had a few weeks to reflect on it – i have a few thoughts. i’m of course disappointed that i did not run it in 4 hours. but at the same time, happy that i ran it, felt great the whole time, and only missed the mark by 15 minutes. not bad for a first time out. 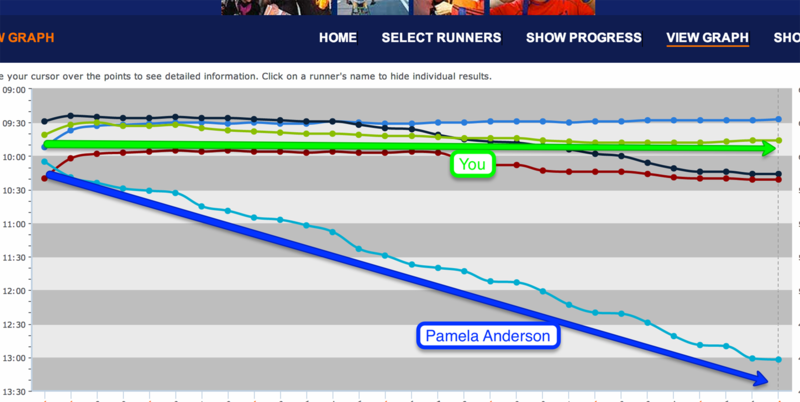 andre sent me a hilarious screen grab after the race that showed my race and pamela andersons (and a few other unnamed athletes) – here you can see, that i was slow and steady, even picked up the pace at the very end. i clearly had a much better race than pamela. the day after the race was fun (ha!) – i never knew walking down the 4 flights of stairs in my apt. building would be so painful. beyond that, the rest was cake. by day 2 – i was on an airplane for 11 hours heading to Hawaii – to recoup, and visit my favorite old friends and their new baby. (which, by the way – i’m SO in love with this little guy). it was a great couple of weeks, filled with days at the beach, pool, strong coffee on the lanai every morning – and lots of local beer and (not so local) wine well into the afternoon and evening. 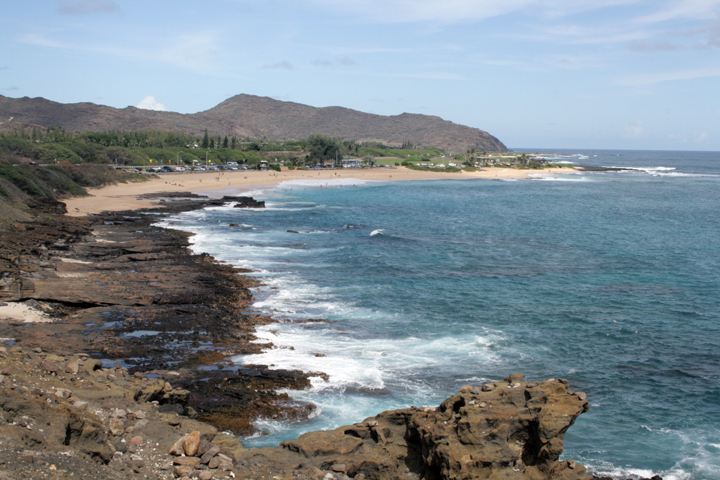 i feasted on local fish, surfed for the first time at Diamond Head on a windy day and did my first few recovery runs around Diamond Head – which was warm and humid – and strangely, felt even harder than the marathon. i headed out earlier today for my first post-marathon central park run. i started in my usual spot, the upper north west corner (aka harlem hills) – was greeted by a beautiful sea of yellow leaves, and a balmy mist. i ran the upper 5 mile loop… dismayed by the fact the east side water fountains are turned off – delighted by the west side water fountains still working! and as i ran down cat hill – i saluted the black cat, and remembered seeing him just 2 weeks ago, with only a few miles left for the finish. i already have 2 races lined up – the turkey trot in saratoga, and jingle jog in prospect park a few weeks after. it’ll be my 9th race – which gives me guaranteed entry to the marathon next year. will i do it? i don’t know. one hard lesson i learned this year is that todays reality, is not guaranteed tomorrow. so we’ll see. but i have my safety net in place and looking forward to the next year. All the hard work paid off. 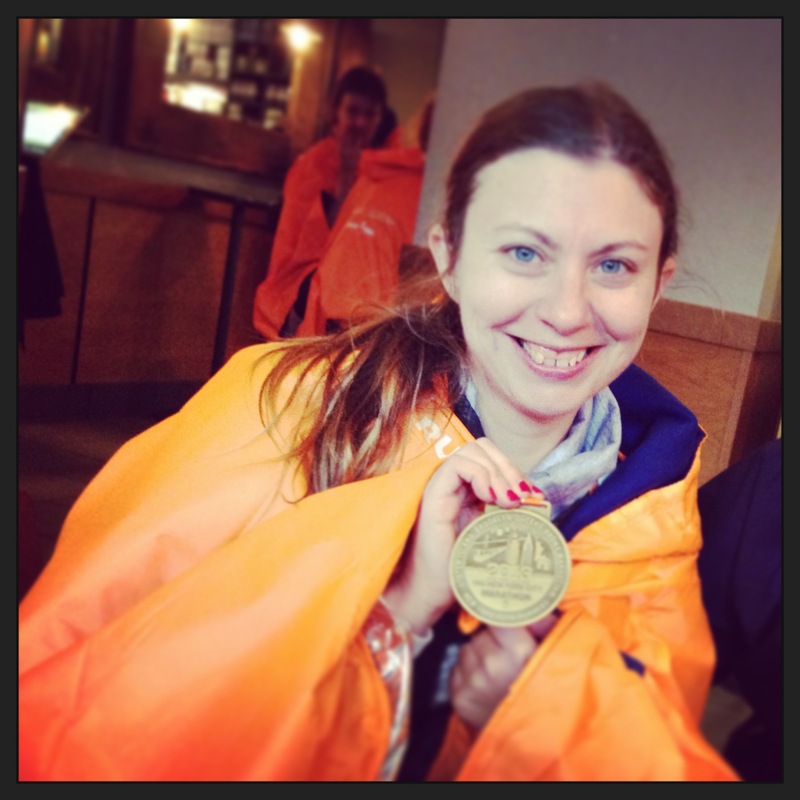 18 weeks of training.. and here i am, successfully finished my first marathon – and not just any old marathon – the ING NYC Marathon! just a few thoughts on this before i fall asleep. i ran steady – never hit the wall, never felt spent, just kept on going.. and felt great. smiled at my friends along the way, and smiled at the finish line. like i said, an epic experience, more powerful than i ever anticipated. i finished in 4 hours, 15 minutes, 43 seconds. i’d be lying if i didn’t say a small part of me wasn’t disappointed just a tiny bit that i didn’t do this in 4 hours. but on the other hand, i had a great race, and finishing the race feeling SO good make me think maybe this isn’t a one and done kind of endeavor. it was do-able, and fun. and before i sign off on my 18 weeks of training and the racing of the marathon. i just have a few thank-yous that must be said..
my mom, linda ronk – who is a huge champion and so very supportive in every crazy endeavor i take on. she was on the sidelines today watching me race, which was amazing. (not to mention that around mile 18 i was feeling pretty damn great, and was excited to see some friendly faces). one of my very best friends, gail winiecki – who, without, i would never be running. 4 short years ago, she convinced me to give it a try – run/walking around the reservoir in central park – which turned into my first “race” – the midnight run in central park – (which we jogged as bandits) – to my very first race, the fathers day 5 miler – she jumped in and ran some of it with me, and i clocked in a proud 10:50 minute mile. today – she also watched me run her first marathon. (and i’d like to note, that last year, i watched her cross the finish line of the NYC Ironman..she truly is amazing). my new friend and fellow run smart project running buddy – kristin manzolillo… we did some looong runs together in the heat – and even more so, wednesday eves in central park speed work. without knowing, she pushed me to be a better runner… oh, and congrats on your fantastic marathon time kristin!! and how could i forget my fantastic coach andre laboy… i’ve never taken on this type of endeavor in my life, and it was great to have someone who was supportive, pushed me to be better without being too pushy – ie, made it fun. who would have thought i’d look forward to speed work every wednesday night, even when it was 90 degrees and humid. and that one time, i had the worst speed work, (lets blame it on CMJ) – and i couldn’t keep up with the group the way i usually do – he told me not to worry, i was running my race, not theirs, and quietly ran with me for about a a mile. i needed that, and it kept me going and remembered that not all runs are good ones. so that’s all for now. i’m going to take a few weeks off, go to hawaii… maybe learn how to surf. 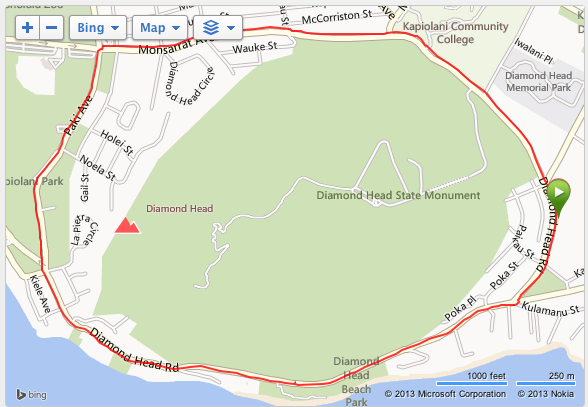 go for a little jog around diamond head in a week..
and in case you’re wondering, i’ve already signed up for my next few races..